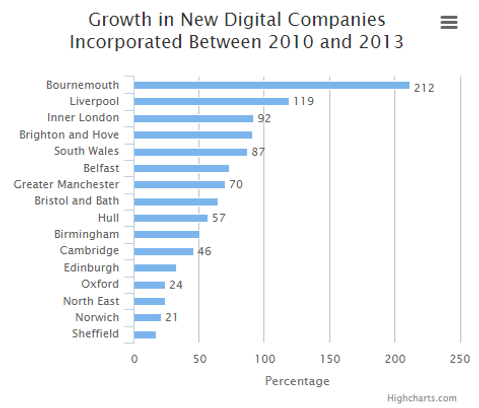 Britain’s digital economy is booming outside London, with 74pc of digital firms now based beyond the capital, and Bournemouth, Liverpool and Brighton emerging as the industry’s runaway success stories. In the landmark Tech Nation report, the largest ever study of the UK’s digital sector, inner London is ousted from its place at the heart of the industry. The growth in this nascent sector is remarkable: 50pc of all the digital companies in the UK were launched after 2008, despite the challenge presented by the arrival of the greatest recession in living memory. Their newness explains why 98pc are classified as small businesses. The UK is currently home to more start-ups than ever before. Last year,more than 500,000 new companies were created, up from 484,224 the year before. The economic impact of this cohort is set to accelerate now that trading conditions are more favourable. While just 56pc saw revenues rise last year, 90pc are expecting a sales surge in 2015. The research – commissioned by Tech City, the Government-backed organisation charged with accelerating the growth of the UK digital economy – found that these new digital start-ups have helped drive the UK’s economic recovery. Baroness Shields, the chair of Tech City UK and digital adviser to the Prime Minister, said the onus is now on the Government to make sure that policy supports these growing firms. Today, 1.46m people – 7.5pc of the entire UK workforce – are employed in the digital industries and job growth in this sector is predicted to outperform every other by 2020. The digital industries do face significant challenges. Broadband was universally cited as a business priority, with all technology firms demanding faster services. Limited access to skilled staff could also stymie growth, and many digital firms have clustered around universities to increase access to the potential employees. Bournemouth West MP Conor Burns said the figures were “really good news”. “It’s not driven by central government, massive investment, Prime Ministers’ champions and tsars – this is a spontaneous pooling together of incredible talent that we have in Bournemouth, particularly across our two universities,” he said. Professor John Fletcher, pro-vice-chancellor for research and innovation at Bournemouth University, said the university had been instrumental in the success. “I think the university is fundamental to it because we have the international recognition in terms of our creative and digital expertise,” he said. “We have the research and the expertise to pass on the knowledge to our students. “We attract a really good group of students and they’re exposed to world-leading research and we’re doing our best now to retain the best of those as they get across their graduation stage,” he said. Gary Seneviratne, founder and director of Bournemouth-based digital agency Adido, said: “We have some really good agencies down here. They’re working with brands like M&S, the British Heart Foundation and Transport for London. The research was carried out by Tech City, the government-backed organisation in east London that serves as a nest for technology start-ups. Tech Nation was compiled using data from DueDil, Adzuna, Crunchbase, AngelList and F6s, and analysed 47,200 digital technology companies across the UK.